Hallux valgus or “a bunion,” is a deformity of the big toe. The toe leans over towards the smaller toes and a bony lump appears on the inside of the foot. (A bony lump on the top of the big toe joint is usually due to a different condition, called hallux rigidus or “arthritis of the big toe”.) Sometimes a soft fluid swelling develops over the bony lump. The bony lump is the end of the “knuckle-bone” of the big toe (the first metatarsal bone) that becomes exposed as the toe tilts out of place. Bunions can run in families, but that does not mean that if you have a bunion, your children will inevitably have one too. The connection may be that bunions are a bit commoner in people with unusually flexible joints, and this can be hereditary. They are also commoner in women than in men. Bunions do occur in cultures in which shoes are not worn, but much less commonly. Shoes that squeeze the big toe or do not fit properly, or have an excessively high heel, may worsen the deformity, particularly in people who are at higher risk anyway. Lots of people have bunions that do not cause them any pain or symptoms at all. Many people with bunions are quite comfortable if they wear wide, well-fitting shoes and give them time to adapt to the shape of their feet. A small pad over the bony prominence, (bought from a chemist or chiropodist), can take the pressure of the shoe off the bunion. High heels tend to squeeze the foot into the front of the shoe and should be avoided. It is often worthwhile seeing a chiropodist if these simple measures are not quite enough. If bunions are causing some problems, the main issue is usually the pressure of the shoe over the bony prominence, which causes discomfort or pain. Sometimes the skin over the lump becomes red, blistered or infected. The foot may become so broad that it is difficult to get wide enough shoes. The big toe sometimes tilts over so much that it rubs on the second toe, or pushes it up out of place so it presses on the shoe. Also, the big toe does not work as well with a bunion, and the other toes have to take more of the weight of the body as you walk. This can cause pain under the ball of the foot (“metatarsalgia”). Sometimes arthritis develops in the deformed joint, causing pain in the joint. If the above simple measures do not make you comfortable, an operation may improve the situation. 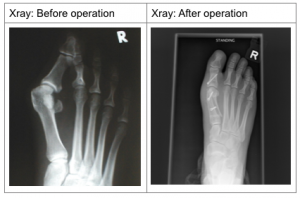 An operation will not give you an entirely normal foot, but it can correct the deformity of the big toe and narrow your foot back towards a more desirable shape. 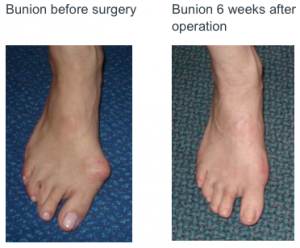 There are a lot of different operations for bunions, depending on the severity of the deformity, the shape of your foot and whether arthritis has developed in the big toe joint. An orthopaedic surgeon who specialises in foot & ankle surgery can advise you on the best operation for your foot. However, an operation may not make your foot narrow enough to wear tight shoes, nor can it fully restore the strength of the big toe. The main reason for having an operation for your bunion is to help with pain relief and prevent further deformity of the lesser toes. It may also help with shoe wear. This operation is not performed for cosmetic reasons alone. Firstly, an X-Ray of your bunion will be taken in clinic so that the surgeon can assess the severity of the bunion. The most common type of operation for bunions involves cutting the bone (osteotomy) and shifting the bone across to correct the bunion deformity. The 2 pieces of bone are then held in the correct place by metal screws and/or a metal staple. The bone cuts usually take 6-8 weeks to heal up and unite together. The type of anaesthetic you will have can vary. There is the option of a general anaesthetic (GA), in which you will be put to sleep or a regional/local anaesthetic, where you will be awake but can have sedation to make you drowsy. The final decision on the type of anaesthetic will be up to the anaesthetist, who will be responsible for your care during the operation. Please discuss any concerns you may have about the type of anaesthetic you would like with the anaesthetist when they see you before your operation. What usually happens after the operation? This operation is usually done as a Day Case operation and you will normally be able to go home the same day. You will have a bulky dressing around your foot after the operation which looks like this. 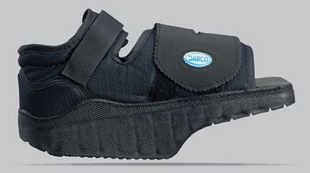 You will be fitted with special shoes (Darco™ shoe) that will allow you to walk on the heel of the foot which has had the bunion operation, with crutches for support. You will be sent home with pain-killers to help with any pain you may have. You will be seen 2 weeks after your operation in clinic to look at the operation site and to make sure that there are no problems or concerns. At 6 weeks, you will be seen again in clinic and have an X-Ray done to check that the position of the bone and healing of the bone has taken place. 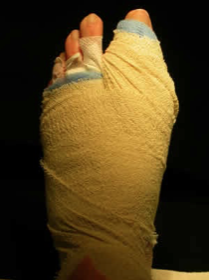 Most patients after their bunion operation take between 6 weeks to 3 months to recover fully. Driving can usually start after 6-8 weeks. If all has gone well, you will usually be discharged from clinic between 6 weeks and 3 months or so.